I hope you and your baby are keeping well. I hope that you are enjoying every moment of your pregnancy and loving the time you spend with your healthy baby. The last time I heard from you, you had told me that the summer heat was getting the best of you and that you were always exhausted, flushed and restless because of that. I understand that summer is the time when we bask in the sun, by the side of the pool or the beach, taking a swim in the cool waters whenever we want to and I keep wondering if you have been able to set foot into the pool lately. If you have not been able to, then I wonder if have spoken to your healthcare adviser to find out whether it is alright for you to carry out mild water aerobics at your stage of pregnancy? From what I have heard and read from books and word of mouth, mild swimming workouts is one of the best options for a healthy pregnancy. And you know what, it will also help you to cool down your body and keep our little bundle of joy happy. So, Moms-To- Be please wait no more and talk to your healthcare advisor as soon as you can so that you do not miss out on this lovely experience which you can share with your baby. Now just in case your healthcare advisor says that you can continue with your swimming and all is fine, then I want you to keep these few pointers in mind because I really care for you and your baby. 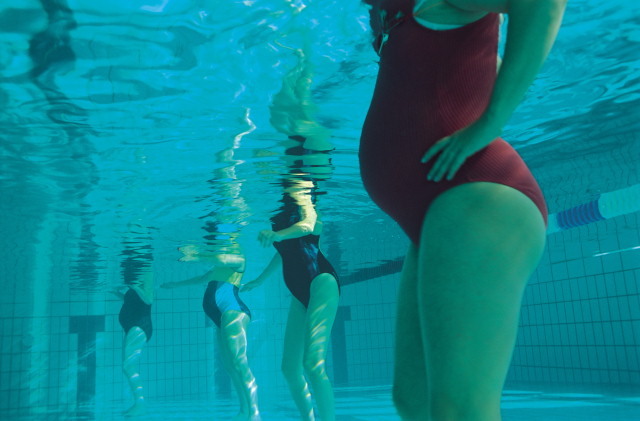 – Dear Moms-To-Be, I have heard that swimming dehydrates us more than normal aerobics. So drink lots of water before you go into the water. – Strenuous exercise is not good for you and our little bundle of joy. So don’t stay in the pool for too long. Keep your routine to 30 minutes everyday. – I have also read that all swimming strokes can be done in the 1st trimester and that the breaststroke is good for the 2nd and 3rd semester but the backstroke should be avoided at all cost. – Please stay aware of your body when you are swimming. If you start feeling dizzy or faint, are breathless, have an irregular heartbeat, experience lower abdominal pain or uterine contractions, bleed vaginally or lose fluids then leave the water immediately and seek medical help as soon as possible. – I do not think I need to tell you this, I am sure you are aware, but still as a gentle reminder please do not dive or jump into the water. It’s such a lovely experience that you are going through Moms-To-Be and I am excited to be a part of your experience. I just could not help looking around and finding ways to help you relax during your pregnancy. As I have been talking to you about swimming ever since the start of this letter, so I would like to share with you these 3 water workouts which will help you to relax your back, strengthen your muscles, and ease your delivery. Let me name and number them so that you can distinguish them from the rest of the letter. This is a very simple exercise mommy dearest and it will help you to stretch your calves and strengthen your arms, shoulders, upper legs, hips, buttocks, and core. For doing this exercise, you need to stand with your legs hip-width apart. Once you are ready, make a small hop and put your right leg forward and push your left leg backward, then make another hop and put your left leg forward and right leg backward. As you do this movement move your arms in the opposite direction to your legs. Repeat 5 times each leg. This exercise will target your thighs, buttocks, shoulders, arms and also strengthen your abdominals. This workout will need you to float on your back, so you will need a noodle wrapped around your upper body to support your weight. Lie back on the water surface and lift your feet slowly as you do so. Inhale as you slowly pull your legs towards your tummy and exhale as you straighten your legs. Keep moving your legs just as a frog would while swimming. This water workout will give you the feeling of a ballerina doing her ballet in water. It is best for your shoulders, chest, back , hips, bums, arms and your core muscle. All you need to do for starting this exercise is stand with both your feet hip- width apart. Now slowly lunge your left foot backwards as you extend your upper body forward such that it floats on the water surface. As you do so extend your hands to the sides as a butterfly would spread its wings. Now let the right leg come up to the surface, and move your hands forward and back once as you would while making a snow angel. Imagine creating a water angel! Remember to inhale while your leg comes up and holding it for about 4 seconds and then letting it go. Now repeat with the other leg. Perform 10 repetitions for each leg. This is all I have in my kitty for you for now Moms-To-Be, but I will be writing to you again with more workouts that you can do safely and also which you can enjoy doing. I hope that I could solve your problem of beating the heat with theses few workouts. Do write back to me and let me know how you feel and if these workouts helped you at all. I will be eagerly awaiting your response.